There are many things to do in and around Negril. Besides offering one of the best beaches in the world, there are many exciting adventures like scuba diving and snorkeling, or if your interested in some land adventures, you can experience the beauty of YS Falls and the history and mistique of the Black River Safari tour with many exotic birds and crocodiles. We offer many suggestions for all kinds of adventurers, simply browse below and click the link for more information on that excursion. 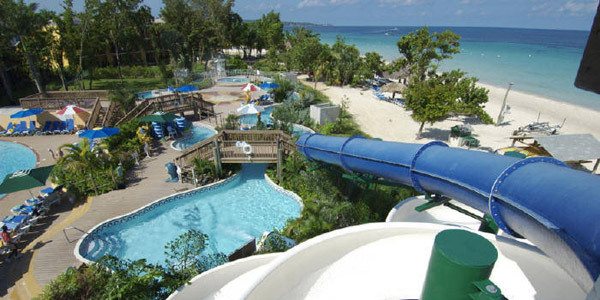 KoolRunning's Water Park: Fill your day with 10 amazing water slides, quarter mile of lazy river, Captain Mikie's Coconut Island for the kids, great food and games galore. Stop over at Anancy Village to enjoy the go-kart and bungee trampoline, and to have an all round Jamaican cultural experience.... And one more thing, don't miss our Park Mascot, Mikie Manatee, doing the "Mikie Skank" on our Kool entertainment stage, a delight for the entire family. Click here for more information. Negril Hills Golf Course: The course at the Negril Hills Golf Club offers an affordable and challenging game with an unpretentious atmosphere. Located a short distance away from Negril's famous beachfront, many holes offer peaceful views of the sea and miles of white sand. The course is carved from the Negril's rolling hills, creating winding fairways and subtle sloping greens. Elevated tees, sand traps, and natural water hazards make the golf course even more interesting. Click here for more information. Rhodes Hall Plantation: A magnificent property with a unique history covering over 550 lush acres located just 5 miles before Negril. There is one mile of private beach and coral coastline gently curling around lovely, reef shielded, Rhodes Hall Bay. Colorful tropical fish develop in our government-protected hatchery and coral formations can be viewed in shallow waters adjacent to our beaches. Natural fresh water mineral springs rise up from the seafloor along our coastline soothing tired muscles. This private working plantation has fruits and vegetables in continuous cultivation including coconuts, bananas, papaya, mangoes, pineapples, oranges, lime, cocoa, plantain, plums, avocado, tamarind, breadfruit, okra, tomato, cucumber, yams, ackee, carrots, calaloo, and allspice. Fish are raised in ponds fed by our natural mineral spring which also provides our freshwater requirements for the entire property. Click here for more information. World Famous Rick's Cafe: The first public bar and restaurant of its type on the West End Cliffs, offering an alternative to Negril's majestic seven mile beach. From the beginning, Rick's Cafe boasted an unrivaled view of the sunset from its naturally formed cliffs. Over the years, visitors and locals alike have designated Rick's Cafe as Negril's premier gathering spot and our sunsets have become a Jamaican tradition. Click here for more information. Royal Palms Reserve: One of Jamaica's leading Eco-tourism attractions. The Reserve is an amazingly beautiful and tranquil forest within the Negril Great Morass. This 300-acre site boasts 114 plant species including the Royal Palm found only in this area and over 300 animal species including birds, butterflies and reptiles. Click here for more information. WildThing Catamaran Tours: Negril's finest Catamaran Cruise Company has a great selection of cruises to offer for your enjoyment. The Wild Thing is a 64 foot catamaran with a capacity of 132 passengers. We will provide you with complimentary pick-up by bus from your Negril Hotel to our location. Click here for more information. Appleton Rum Estate Tour: Blending rums since 1749 and the Rum Distillery is sited beside the Black River in one of the most beautiful valleys in Jamaica, south of Montego Bay. You can savour these award-winning rums after you tour the distillery and learn the details of the distilling process from sugarcane, molasses, sugar, to wine and rum. Bar, gift shop, souvenirs and snacks are available. Click here for more information. YS Falls Tour: This attractions is located about 1 1/2 hours from Negril. It is a day tour and is often combined with guided tour or Black River. Although not as popular as Dunn's River Falls, YS it is one of the most spectacular waterfalls in Jamaica and set in a pristine environment on the unspoilt South coast of Jamaica. The great thing about YS Falls is that it is never crowded. Be sure to bring you swim suit, trunks, and pair of water shoes as well as a pair for walking. Click here for more information. Black River Safari Tour: Located east of Negril, the small town of Black River to enjoy a cruise on the river of the same name. It's a drive along Jamaica's south shore, a region that has remained nearly untouched by tourism (although plans call for the Sandals chain to erect a new property aimed at families named Beaches in the near future). This tour takes travelers up the Black River, much of the water comes from the runoff from the peat bogs. The black sediment colors the bottom of the river, giving it the name. Click here for more information. Canopy Tour: You'll be swinging through the trees with the greatest of ease on this adrenaline-charged tour! Soar from one platform to the next amongst the tree-tops 45 feet (14 meters) above the ground! You'll feel like Tarzan or George of the Jungle as you ride through the canopy with the clear air all around you! Your journey through nature will be via a series of decks and platforms, connected by traverses, mounted in the trees of the rainforest. Click here for more information. Martha Brae Bamboo Rafting Adventure: Enjoy a scenic drive and bamboo rafting adventure on this Jamaican half day trip. The exotic Caribbean flora and fauna will have you amazed as you slowly drift downstream, listening to nature's gentle voice. Built for two, these bamboo rafts make for a romantic day out on your family vacation! Travel along the coastline to the historic market town of Falmouth before heading inland to the Great River. Click here for more information. Mayfield Falls: It's truly a nature lover's paradise - two beautiful waterfalls, 21 natural pools, 52 varieties of ferns, an abundance of exotic tropical flowers and plant species, and several types of birds, butterflies, and indigenous wildlife. Mayfield Falls offers some of the prettiest scenery Mother Nature has to offer. Driving through the tropical Jamaica rainforest, the first thing you notice is the clean, fresh mountain air... Come experience Jamaica's #1 eco-tourism attraction and nature at its best! Click here for more information. Jamaica ATV Off-Road Adventure to Sandy Bay or Rosehall: Journey through the rugged dirt trails of maggoty estate on your powerful easy to handle four wheel bikes up to 2200 ft. above sea level and explore the unique mountainous terrain that takes you to the beautiful community of cascade. Along the way you will learn about Jamaica’s rich heritage and see fantastic panoramic views of the Caribbean coastline. Click here for more information. Jeep Safari: A four-wheel drive tour through the wilderness, highlighting Jamaica's Beauty, culture and history. A journey through the rocky interior of the island negotiating the terrain up into the mountains surrounded by the spectacular view of Montego Bay. Experience the flavour of local culture and stop at a former slave hospital converted into a church in 1846. Marvel at the ruins of a sugar factory dating back to the 1700's. Pause for a breath at the picturesque river for a refreshing dip and cool off before taking an exhilarating climb up the cascading water falls. This tour is accessible to the physically challenged. Age limit: 6yrs and older. Lunch not included. Click here for more information. Great River Adventure Tour: Just a short distance from Montego Bay your adventure begins with a drive through the rainforest mountains. Approximately 30 minutes from Montego Bay you arrive at the quaint village of Lethe and the Great River Valley. Upon the arrival at the adventure starting point you are met by your professional guides and attend a briefing outlining your adventure, safety guidelines and are outfitted with safety gear. It is now time for some fun. Boarding your professional quality tubes small groups set out on this expansive river with a small ratio of guests to guide maximizing the pleasure of your experience. Click here for more information.